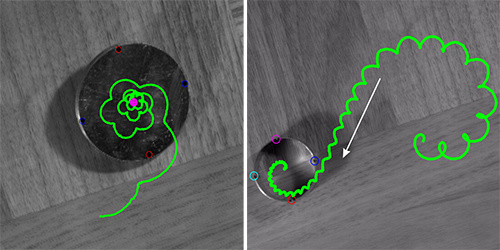 When physicists get bored, curious things happen. Meet Mir Abbas Jalali of the University of California, Berkeley. He was playing with his wedding ring on his desk one day. Like you do. The ring wobbled and spun like a coin at first. But then it took an unexpected turn. Literally! Jalali was surprised. See, when you spin a coin, its path is a spiral that circles inward. Essentially an O shape. But Jalali’s ring did something else. It was hard to tell what, exactly. So, he used high-speed video to record spinning rings. In slow motion, here’s what he saw: The rings started out making an O. But halfway around the circle, they veered off into an S shape! Why not a spiral? Jalali says It’s air drag. A disk shape like a coin compresses air between its face and the ground, forcing it in the same direction until it collapses. But air can keep flowing through a ring. That, plus friction, forces the ring to switch directions. A good metaphor for marriage? More research is needed.